Hiltner, Harry of Galloway passed peacefully on the evening of February 12, 2013, with his loving wife, daughter and son-in-law by his side. For the past year and a half, Harry courageously fought his battle against cancer. Harry’s optimism and absolute love-of-his-family, allowed he and his girls the strength to make it through this difficult journey. Harry began his professional career in the height of the casino development, as a Union Electrician. After a few rewarding years in this profession, Harry changed his course and worked as a Fireman at the Atlantic City Airport. During this tenure he also enjoyed his time as a volunteer Firefighter in Bargaintown. 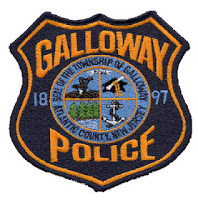 Harry continued his civil service as a Police Officer for the Galloway Police Department. During his almost 20 years of protection and dedication, Harry achieved the rank of Sergeant, and served as one of the most distinguished leaders this community has come to know. Harry was honest, fair, dedicated and patriotic in his everyday ways. He was a religious Philadelphia Phillies fan, and an always-optimistic Miami Dolphins supporter. Harry took great pride working on his family’s property, and cruising around on his John Deere tractor while listening to the “Boss” on his headphones. His daughter Ashley was his favorite basketball opponent, as they enjoyed many backyard challenges at their home, and Harry was always there to share his many words of wisdom to his older daughter, Lisa. Harry’s wife Jean will cherish their quiet moments they shared together. These times included watching deer, turkeys and especially their favorite, Purple Martins, among other wildlife that wandered onto the Hiltner compound. The beaches of Brigantine were a favorite past time for all the Hiltner’s, and Harry will always have a spot in the sun with his family there. His family takes comfort in knowing that Casey, his faithful black lab, is wagging his tail and playing fetch with his best friend. Harry is survived by his heart-broken Bride Jean, his daughters Lisa and Ashley, Harry’s in-laws Ralph and Joan, his brother and sister-in-law Len and Joan, his parents Eleanor and Harry Sr., sister Lynette and husband Ray, sister Sue and husband Ray, and his many nieces and nephews who loved and adored him. Harry will be sadly missed by his many friends, neighbors, coworkers and drivers. Visitation will be held at Beacon Church 420 S. 6th Ave, Galloway, NJ 08205 from 2 until 4 pm followed by a memorial service on Sunday, February 24. Services have been entrusted to Wimberg Funeral Home in Galloway, NJ (609) 641-0001. For condolences, please visit wimbergfuneralhome.com. In lieu of flowers, the Hiltner family is accepting monetary donations at TD Bank for the Ashley Hiltner Scholarship Fund that has been created to support his daughter Ashley in her future educational endeavors. GallowayTwpNews.com and Publisher Lisa Tilton would like to offer our sincere condolences and prayers to the Hiltner Family.